My husband and I are a huge fan of Supreme Protein bars. We first tried these bars last year when I was sent FIFTEEN (yes, fifteen) boxes of these bars for review. Well, the company came out with a new kind called peanut butter and jelly and I got to review them. When I first got the box, I saw that the bars have over 400 calories which for my husband is a good thing (he is trying to gain weight) and for me, too many calories for one bar. When I opened the box, I realized that the bars are really double the size of any usual bar. Therefore, I just cut one in half and went to town on it. My husband and I both love these PB & J bars. They are our favorite variety of this brand. They taste like a candy bar and have 30 grams of protein (15 grams for 1/2 a bar). There is actually a layer of gooey jelly which is awesome. This bar is salty and sweet. I can almost guarantee that this box will be gone within two weeks. 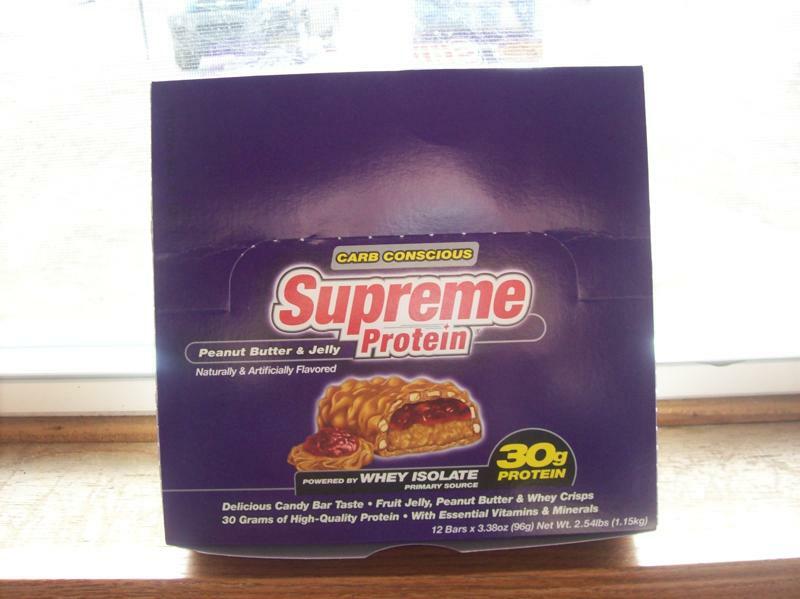 Thanks Supreme Protein for sharing your new flavor with me! Thanks for a great review. I like these bars, too. I'm trying to keep a lid on carbs for weight management. The Supreme Protein Carb Conscious bars I like have 36g of carbs. 27g are sugar alcohols. Are they truly metabolized differently from other carbs, so that you really can subtract them from the total carb count? Thanks!